This entry was posted in Kirkwood Decor Blog Posts on July 9, 2014 by KirkwoodDecor. -The easiest sanding of all the UPOL body fillers. -High adhesion to a wide range of substrates: steel, aluminium, GRP and wood. This filler is very easy to sand and therefore recommend that nothing coarser or lower than P80 paper is used. 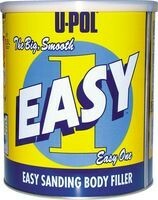 I hope this review was helpful and that you agree U-pol Easy 1 is the best wood filler on the current market.